Adam Wormann started us off yesterday and Tim Schmoyer follows with his post today. Jonathan McKee will chime in tomorrow, Mark Riddle on Thursday, and Tony Myles wraps it up on Friday. 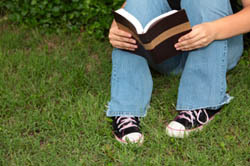 While I usually tend to gravitate toward writing “practical” posts, this one is a bit difficult for me to list as, “4 steps for programming teenage brains to read the Bible,” not that we’d want to do that even if we could. The most practical I can get with this to continually talk about the importance of digging into scripture on a personal level, talk openly and frequently about your own time in the Word, and maybe even give them time to spread out and read it at youth group in place of a teaching time. Several years ago I did the latter every couple weeks with a high school small group. The first time or two the kids were like, “Ooookay…” (unfortunately, right?) but it turned into something they asked for and looked forward to, which was cool. We spread out around the home with a Bible, read for 30 to 45 minutes (either something they chose on their own or, if they didn’t know where to start, something we recommended). When we gathered again after the reading time, we debriefed by sharing what we read, what stood out to us, what we think God was saying to us through it, and more. It was always very energizing each time we did it. While practical ideas like that can be helpful, I think we need to dig a big deeper here. Obviously we can’t just trick kids into temporarily reading the Bible — we want it to become something they take ownership of for the rest of their lives. Long-term success of helping teens dig into scripture will be found in helping them adopt an internal value of personal Bible study. They’ll say school, work, and general busyness gets in the way, but we all know that we make time for what’s important to us. It’s about values and priorities, not time management. We know that to be true for us, too, right? The answer to this question really lies in each of our own hearts, not in extrinsic motivations. Why do you spend time in God’s Word? What drives you there? Or, if you don’t, why not? I don’t care who you are, it’s not the busyness excuses you make. What are the underlying reasons that make you jump to those excuses? Maybe you’ve bought into our society that tells us that everything needs to be fun and entertaining? Maybe you’re not sure what the point of personal Bible study is? Maybe you don’t think it makes any difference if you read God’s Word or not? Chances are, teens are experiencing the same thing you are. The excuses may change as they get older, but they’ll still fall back on excuses just the same, and maybe even believe them, just like we often do. If you can answer those questions for yourself then I think you’ll be able to start helping teenagers answer those questions, too. The issue then becomes helping them grow past those heart issues as we grow past them ourselves. Invite them into your own journey and walk together. One of my overarching principles for youth ministry applies here: Don’t ask teens to do something you’re not first doing and modeling yourself. When you own it yourself, you’ll teach and lead teens with your life and heart instead of your words, which is always a lot more powerful. QUESTION: How does your own personal Bible study time affect how you lead and teach teenagers to do the same?